'Israel has no choice but to be aggressive,' Trump says regarding Syria, and expresses support for two-state solution. 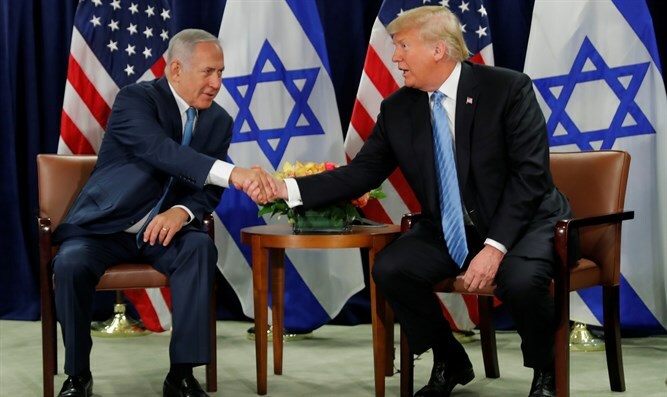 US President Donald Trump met Wednesday with Prime Minister Netanyahu on the sidelines of the UN General Assembly. Trump said the move of the US embassy to Jerusalem was something which "I guess was controversial, but it's turned out to be very positive in many ways," he said, also noting "a lot of progress is being made in many other areas." He expressed his support for "everything Israel is doing as far as their defense is concerned." "[The Israelis] are aggressive, and they have no choice but to be aggressive. It's a very difficult part of the world. So I just want to let Benjamin and all of the people know that we are with you, we are with Israel 100%." Responding to a question on the issue, Trump estimated his peace plan could be presented "over the next two to three to four months." "I really believe something will happen. It is a dream of mine to be able to get that done prior to the end of my first term," he said. Trump also said, apparently to the consternation of the prime minister, he thought a "two-state solution" was the best one. "I like two-state solution. That's what I think works best. I don’t even have to speak to anybody, that's my feeling," he said. “You may have a different feeling. I don’t think so, but I think two-state solution works best," he told Netanyahu, who did not respond. He referred to the PA's disregard for American-mediated efforts and the subsequent punitive measures taken by the United States, noting that the PA would "absolutely com[e] back to the table." Netanyahu gave Trump a "manifold thank you" for his wide-ranging support of Israel. "First, thank you for your strong words yesterday in the General Assembly against the corrupt terrorist regime in Iran. You back up your strong words with strong actions. And I think the fact that you've brought American sanctions to bear has cut the cash machine of Iran and its campaign of conquest and carnage in the Middle East," he said. "Second, I want to thank you for the extraordinary support you've shown for Israel in the UN. No one has backed Israel like you do, and we appreciate it. "Third, this is the first time we meet after the American embassy has been moved to Jerusalem. You've changed history, and touched our hearts. "Fourth and last, I want to say how much I appreciate your robust support for Israel's right to self-defense. Israel will continue to do what is necessary to defend ourselves against Iranian aggression in Syria , Lebanon, anywhere else. We have no doubt that, as we do so, we'll enjoy the support of President Donald Trump and the USA." "The American-Israeli alliance has never been stronger," Netanyahu asserted. "It's stronger than ever before under your leadership. I look forward to working with you and your team to advance our common interests, security, prosperity, and peace with Israel's neighbors and the region."